This article is about australian cricketer Nathan Bracken. An ODI specialist, Bracken is a very good left-arm pace bowler. Here is given the profile, cricket career and records of Nathan Bracken, who has once been the No. 1 ODI bowler in ODI Bowlers Ranking. 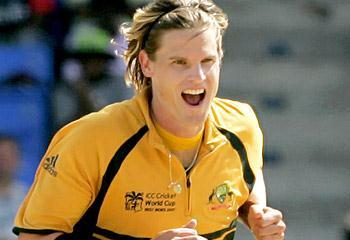 Nathan Bracken is a former Australian fast bowler who is a very effective in One Day International Matches. He joined Australian Cricket Academy and started playing in First Class Cricket in 1998. His first major success in cricket comes in the 2000-01 season where he took 29 wickets with an impressive Bowling Average. At the same time he got place in the Australian ODI squad after a good show in the Mercantile Mutual Cup. His Test debut came against India in 2003. In the series, he took just 6 wickets in 3 Matches. He played his next Test match after 2 years of gap against West Indies, but unable to impress the selectors. On the other hand, he was a very successful bowler in the shorter form of the Cricket. He completed his 100 ODI wickets in just 60 Matches. He is also having the record of taking most number of wickets by an left-arm pace bowler in ODI for Australia. In 2008, he become No. 1 bowler in ODI Ranking for Bowlers. He played for Australia in two World Cups - 2003 and 2007, but his success came in the 2007 Cricket World Cup, where he took 16 wickets. Nathan Bracken has also played the shortest format of the game for Australia and also in IPL (Indian Premiere League) for Royal Challengers Bangalore. In this batsman dominating format of the game, he has managed to keep his Economy Rate below 7 runs per over, which is quite impressive for a Fast bowler. Nathan's bowling average in T20Is is also good and he has picked a wicket per match in this. look at Nathan bracken's record 5 test matches and 12 wickets vs 116 one day's internationals 174 wickets+ 19 matches ,19 wickets in T-20's.One wonders why he was so successful in shorter format against the longer version of cricket.If it had been India we would have persisted him with test cricket,and made him to break down quickly.There can be many reasons why he didn't do well in tests and why he succeeded in one day's.Why compare ,why do you need a person to be jack of all trades?In future this is the way it should be with so much of cricket being played it would be very wise to groom players for different formats according to their choice .This will yield better results on the long run and also helps to keep many players in the reserve with enough experience if their front line bowlers break down.